Oh the wonders of cooking with alcohol. If I really enjoy the flavor of liquor in a cocktail, then why in the world would I NOT enjoy that flavor in a home cooked meal? The major benefit is that I can enjoy the flavor without the hangover the next morning. 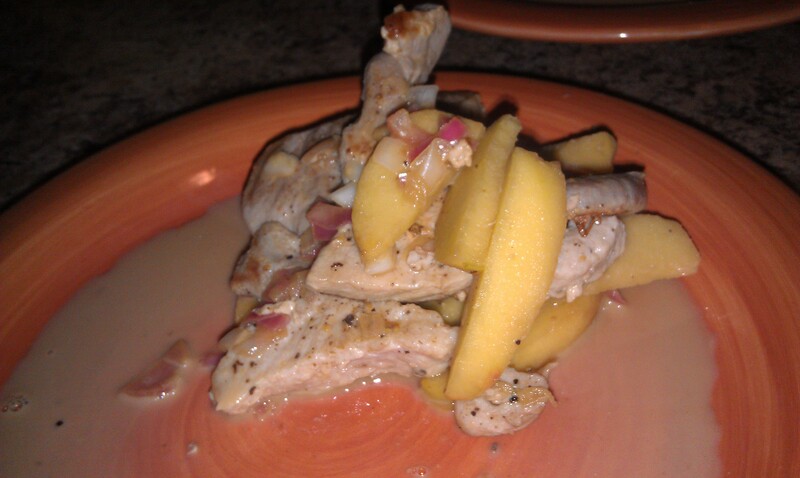 Kitchen experimentation is one of my favorite pastimes. So I knew that I wanted to make a Captain Morgan glaze for pork chops. Try googling rum glaze and the first and most common thing that comes up is pineapple rum glaze. And yet I feel like no one has tried it with spiced rum. Why is that? It was delicious! I used the black Tattoo spiced rum, and I used a mix of pineapple juice and mandarin orange juice because I didnt have enough pineapple juice. But I definitely would like to try it again with the classic spiced rum and straight pineapple juice. Flavor combinations are bouncing around in my mind. What about rum lime on chicken? Does cranberry and rum go together? What if I mixed orange and pineapple? Or how would it turn out if I used a juice with a thicker consistency? So the process was relatively simple. Although a little time consuming and exhausting. The worst part about making a glaze is that it has to boil and be whisked for like TEN minutes! My arm wanted to fall off. It’s like making a meringue without an electric mixer. Definiteky worth it though. This glaze has a half-cup of the rum, 12 ounces of fruit juice, two-thirds of a cup of dark brown sugar and a teaspoon of cinnamon. It ends up being a thick syrupy texture with very bold and prominent flavor. 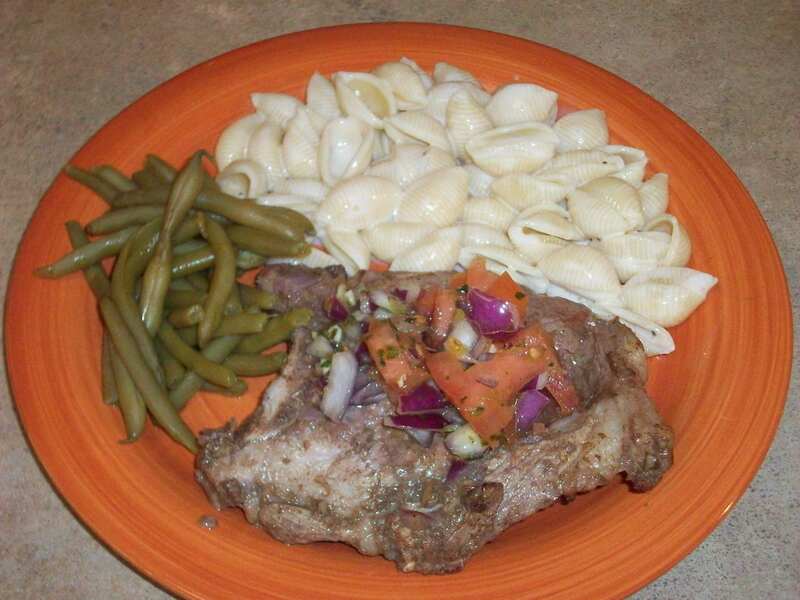 When I worked with my pork chops, I put some AP flour on a paper plate, sprinkled some seasoning salt on top, and the put the porkchop in the flour on bkth siees. Then I put it in a preheated pan with about two tabelspoons of olive oil. This helps create a nice crust on the pork chop and gives the glaze something to stick to. Let it cook a couple more minutes each side before spooning some of the glaze that has cooled slightly over the top. As it’s cooking it will create even more of a syrup that you may just want to pour over a waffle because it smells that good. Flip only twice, as you dont want to lose any of that yummy crust, and baste each time with a spoonful of glaze. You will have leftovers to cook with that chicken for your salad tomorrow, I promise. I served it with rice and may have licked the plate. Try it, you wont be dissapointed. 1. Pour the rum and the fruit juice in a pot at room temp. Whisk together and turn on the heat to low. Add the butter and sugar. Keep on low and whisk frequently until the sugar is completely dissolved and tbe butter is completely melted. Have patience, this will take about 7-10 minutes on low. 2. Bring the heat up so that you get a rapid boil. Let boil for 7-10 minutes, whisking constantly to cook off the alcohol. BE CAREFUL! Alcohol is highly flammable. 3. Pull off the heat, and let sit for approximately 10 minutes while you get your meat ready and begin cooking it. The past couple of days we had some amazingly delicious meals for dinner. 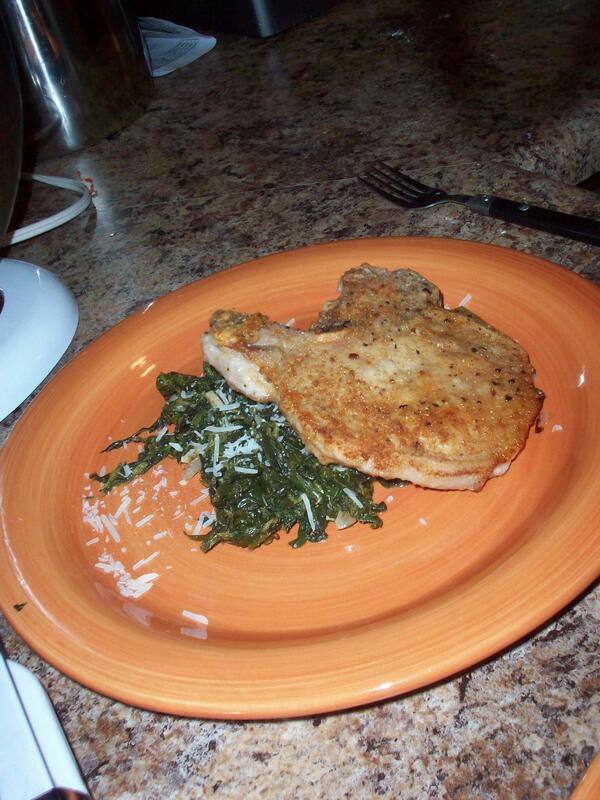 Last night, it was a shrimp pasta, tonight it was porkchops and spinach. Both were done rather healthy compared to how we normally eat. And for once – there were two nights in a row with NO LEFTOVERS! This is an accomplishment for me I promise. 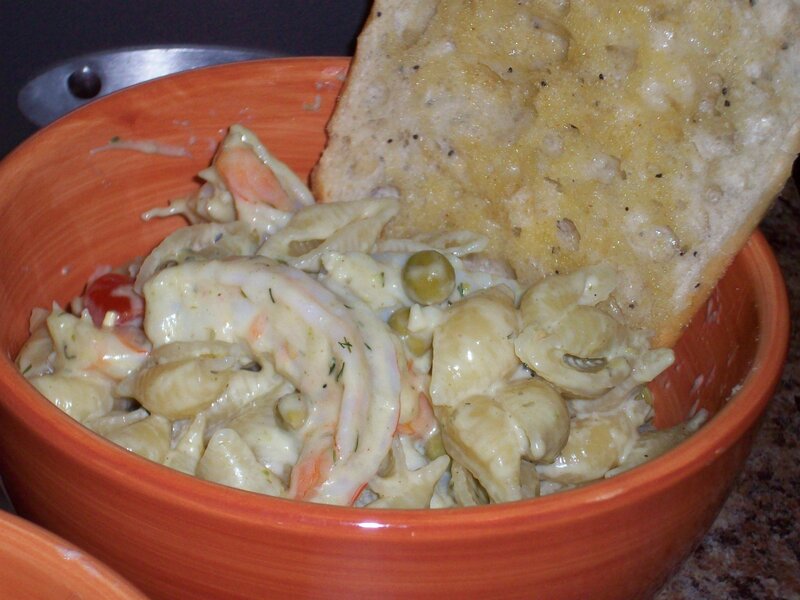 The shrimp pasta, I took some help from the new Philadelphia Cooking Creme, the Italian Herbs and Spices kind. I mixed about half a tub of that with about a tablespoon and a half of prepared pesto, and another tablespoon of regular cream cheese. I added some dill and some thyme to that mixture and heated it on the stove. Then I threw in some leftover peas we had from the night before, and then halved some cherry tomatoes at the last minute and put those in as a topper. I cooked up some shell pasta, tossed it with half a block of grated mozzarella, and then the sauce mixture and finally about a half-pound of shrimp I sauteed until they were just pink. These past couple of nights I’ve just been trying to take my knowledge of what tastes good together and running with it. And it’s worked out splendidly. Tonight, we had a balsamic spinach and the best pork chops ever. (Mom you need to try cooking them this way!) I quickly declared that I had been making pork chops wrong my entire life, and my hunny said he’s never liked spinach until now…The secret is in the flour. Start by saute-ing the onions and garlic on low in a small pan with the olive oil until they get very fragrant. While those are working, mix the flour, ground mustard, steak seasoning and oregano on a paper plate. Heat up the canola oil in another pan on medium until the oil moves around the pan like water (quickly and easily). Put the pork chops in the flour mixture, and press and coat both sides, then put them in the heated canola oil. Go back to the spinach pan, and once it’s all fragrant, put the spinach in there and turn the heat to medium low. Move it around the pan so it doesn’t stick and let it work. After about 4 or so minutes, flip your pork chops. The edges should be just starting to get white. Add the balsamic to the spinach mixture and stir it up well to combine it with the onions and garlic as well. Let that work for about a minute, then add the dried spices. Stir it all together. 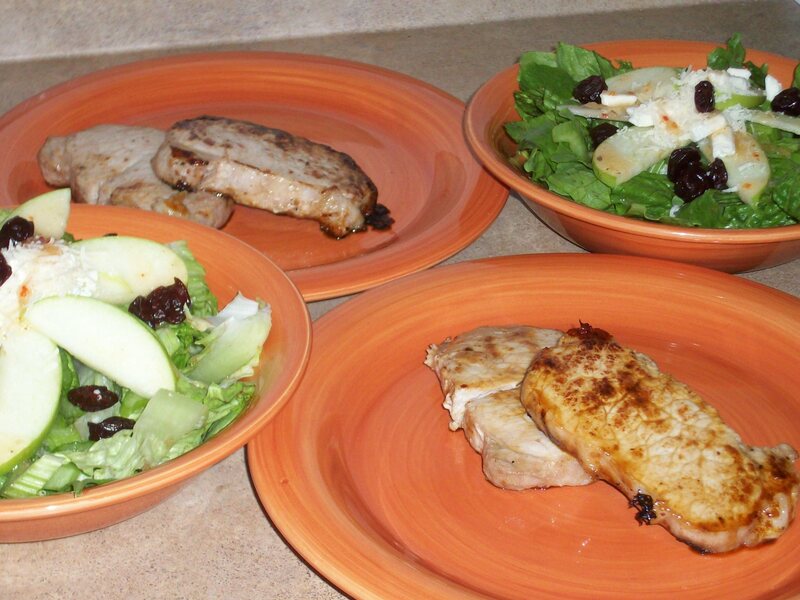 About this time, your pork chops should be ready to flip again. Try not to move them around the pan when you’re not flipping them, because you don’t want the wonderful golden skin that is forming on there to break off. 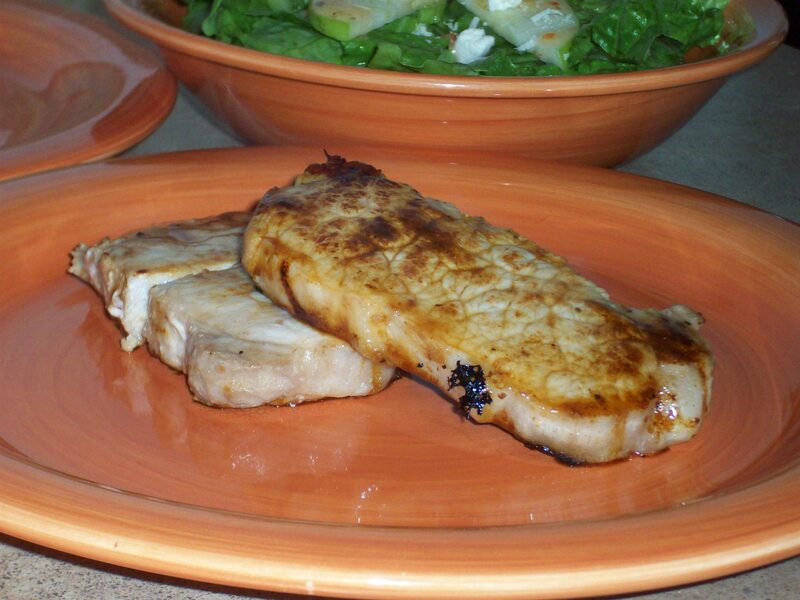 Dependent on the thickness of your pork chops, they should be ready in about 2 minutes. Add the lemon juice to your spinach, stir it in, and then move that off the heat. Plate the spinach first, and then top it with the parmesan. Put the porkchop on top of the spinach for a very pretty presentation. 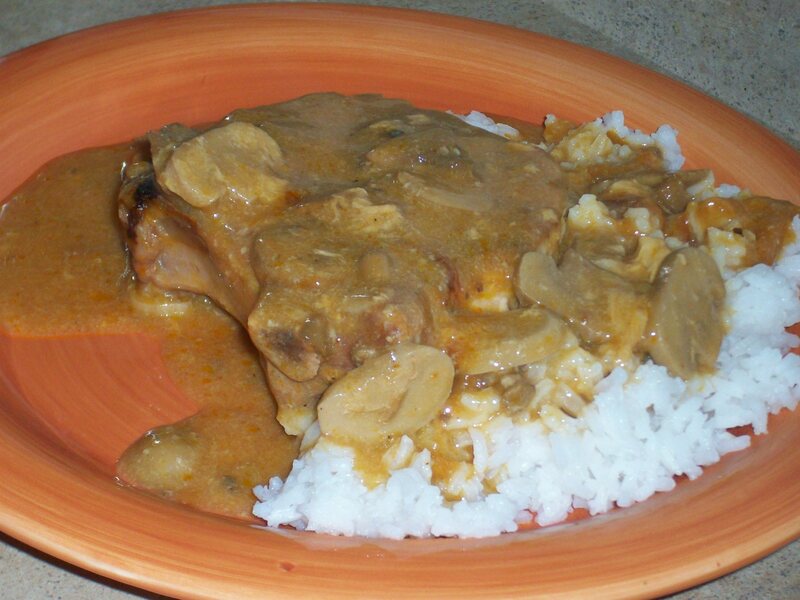 I changed up her recipe a bit, using golden mushroom gravy instead of cream of mushroom…and dusting my pork chops with spice. So the basic idea is that this is a budget meal, as we’ve been on a budget lately. We had a really good cut of pork chop, so they were thick, but small portions, and I added some of my mesquite grill garlic spice before I seared them on both sides. Next, put them in a casserole dish, cover them with a can of Campbell’s Golden Mushroom soup, and then fill the can with milk and add it to the dish. Add a small can of sliced mushrooms on top, and throw it in a 350 degree oven for an hour. I made some rice to go with it, then poured some of the gravy that was created by the soup and milk over the rice and over the pork chops when I served it. It tastes pretty good with peas too. So this recipe idea came from a friend of mine who is pretty good in the kitchen – he made the tortilla soup from my last post. 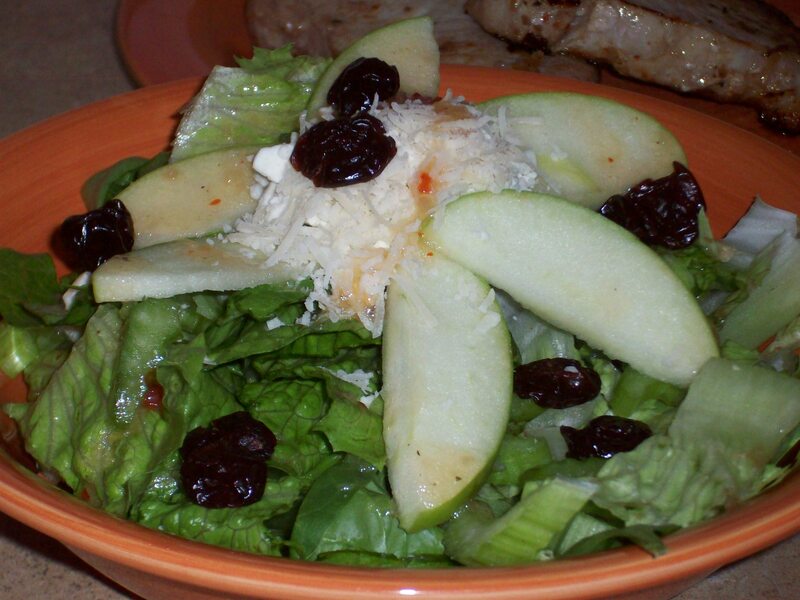 I then used his recipe, adapted some things to my liking, and presto, it’s amazing. 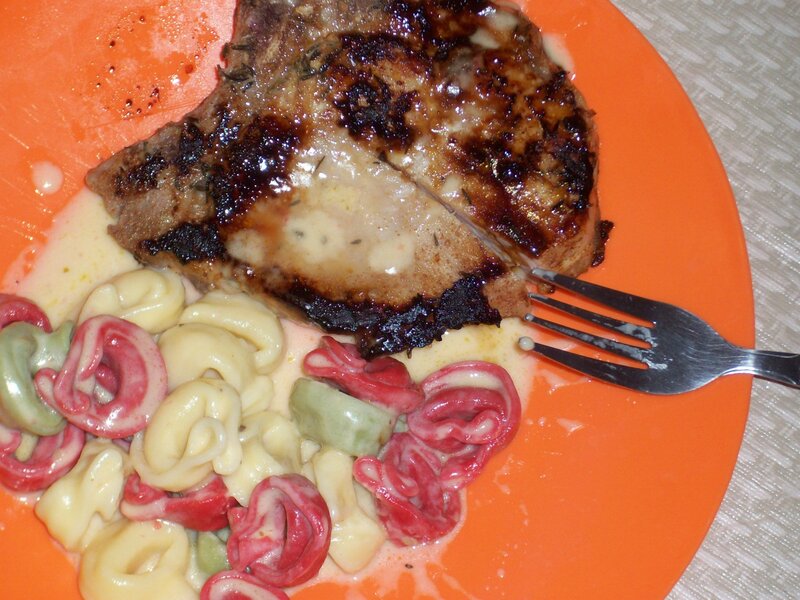 Pork chops and tortellini with cheesy beschamel. By far the most scrumptious and tantalizing meal I've made yet. So pork chops. I used bone-in. I’m sure it would work with boneless as well. Ziploc bag with Captain Morgan Spiced Rum and some spices. Let it marinate. Even just marinating for a few hours and being flipped once they were still so good. I couldn’t believe it. Then tortellini. I used the kind from a bag, and then made my own sauce. They had pretty colors, and come to find out, each pretty color was filled with something different. That’s cool. The havarti/cheddar/parmesan beschamel sauce took two tries to get right, and some experimenting to achieve a flavor that I liked. Unfortunately, I’m not sure if it was the “right” flavor, but it was good so who cares? The recipes are on my recipes page…though the name for the pork is a little weird, and it’s actually a combination of two recipes to get the whole plate. Enjoy!